What are some of the biggest wastes in a hotel or a resort? The first answer that comes to mind is the waste of water. Washing towels that may not need to be cleaned. Many hotels and resorts reduced the water used to wash towels by asking guests to put dirty towels on the floor and hang ones that are clean. It has become a fairly common practice. So, what is the second biggest waste for a hotel or resort? How about the consumption of electricity? Have you ever left your room and left a light on or the TV going? Earlier this month, I was on vacation at a large beach resort with over around 1,000 rooms. Imagine if half of them left a light on in the room for 3 hrs extra a day. That is a large bill. The resort I was staying at found a way to error proof this and cut down their electricity consumption. The picture below shows how they did this. 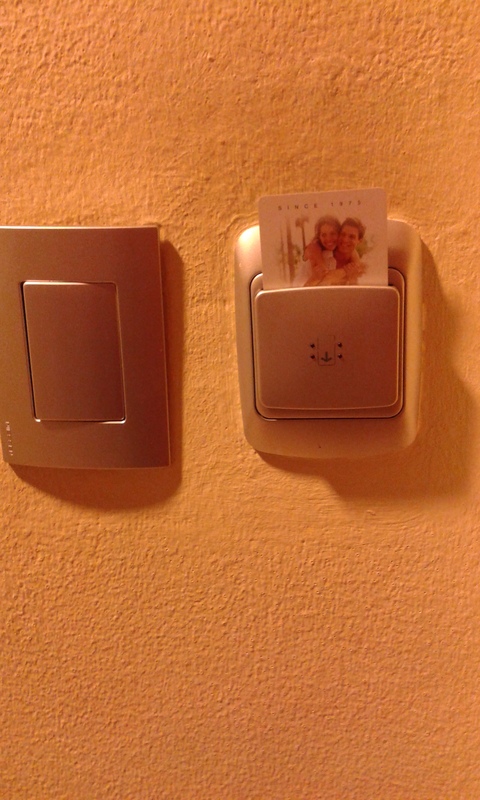 The slot on the right is for the room key card. You have to slide the key into the slot to activate the electricity in the room. The guests could then use the lights, TV and ceiling fans. You always need your key when you leave the room (unless someone is still in the room), so you pull the key out and the electricity in the room is deactivated. It was simple to use and made the right thing easy and the wrong thing very difficult. Have you seen any other error proofing methods to save electricity? I was at IKEA the other week and saw the best error proofing for cart safety. If you haven’t been to an IKEA store, it is massive. The parking for our store is ground level and the store is on the second and third levels. Elevators are used to help get the carts down to the ground level as well as an escalator. The shopping carts have suction cups on the wheels that engage as you get on the flat escalator. For safety reasons, IKEA does not want customers to take the flatbed carts down the escalator. Products could slide off and cause an accident. In line with the traditional mindset, there are signs posted showing a normal shopping cart is OK to take down the escalator and the flatbeds are not. In a lean error proofing mindset, IKEA made it impossible to take the flatbeds down the escalator. There are two poles that are four foot high as you enter the escalator. The normal shopping cart fits through the poles with a couple of inches to spare. The flatbed cart is made to be angled out wider so it can’t fit. The poles are also positioned so neither cart can enter from the side. It was a great system that a lean person can truly appreciate. Today’s guest post is by James Lawther. James gets upset by operations that don’t work and apoplectic about poor customer service. Visit his web site “The Squawk Point” to find out more about service improvement. On 4th March 1984 Libby Zion (an 18 year old known to be using anti-depressants) was admitted into a hospital in New York with a high fever. That night, Luise Weinstein, a medical intern 8 months out of medical school, was on call. He discussed her case over the phone with a senior doctor, and then prescribed two drugs, a pain killer and a sedative. The next morning Libby was dead. The subsequent inquest found that a reaction between the two medicines and her anti-depressants was the cause of Libby’s death. Why was she prescribed those drugs by the medic? Didn’t he know what would happen? It transpires that like all medical interns he had been working a long shift. He was over worked and sleep deprived and made the wrong decision. How long do you work? How long can you expect somebody to work? In the UK and US there are laws that prevent lorry drivers from working more than 11 hours without a 10 hour break. 11 hours is also the time it takes to fly from London to Los Angeles. Would you get on a plane flying the return leg if you knew that the pilot had just flown the outbound trip? That shift, Luise Weinstein had worked 36 hours. Ten years later the New York State Department of Health conducted surprise inspections at a number of hospitals. They found that over half of surgical residents work in excess of 95 hours a week . Why do the hospitals flout the law? Simply because it would cost them a lot of money to obey it. Lean thinkers talk about purpose, they say you should always focus on purpose first and foremost. If you do that efficiencies and cost savings will come as a by-product. Hippocrates is often quoted as saying “first do no harm”. Perhaps that would be a good purpose for the hospitals to focus on. Error proofing is a concept where systems are designed to help prevent failure. A common Japanese term is poke-yoke. There are different levels of error proofing such as prevention, detection, and warning. Prevention is where the process is designed to work one way and one way only. An example would be the charger cable for you phone. The end of the cable is shaped so it will only insert into the phone one way. Detection is a method that senses something is wrong and lets the process know. An example would be a piece of assembly equipment that senses all the components are not in the machine and a light turns on, but the equipment can still cycle. Warning lets someone know how to correctly execute a process. A colleague of mine showed be a great example of this for our Overhead Projector case. 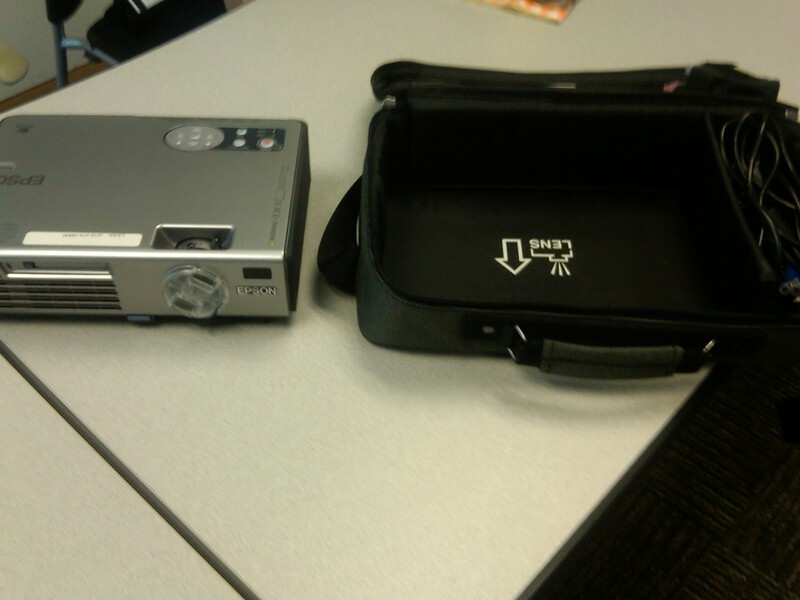 The group was having a problem with people putting the projector in backwards. It caused damage one time. Quick, simple, and easy to understand. It may not prevent someone from putting the projector in backwards, but it does significantly reduce the chances and makes the right way visual. Error proofing or jidoka (the Japanese term) is a concept that is common in the lean world. The basic concept of error proofing is setting something up so that there is only one way to do it. This eliminates the possibility of errors. This concept is typically thought of as a manufacturing concept only. It isn’t though. It can be translated to the data world like an electronic form that will not submit unless certain fields are filled in. The underlying thought with error proofing is to make the right thing easy to do and the wrong thing impossible to do. This is something I learned from Jamie Flinchbaugh. Below is a picture of what I think is a good example of this thinking. This is outside a shop in an indoor mall. Keeping the store clean and easy to shop is the goal. I have seen too many stores that ask patrons to not bring in food or drinks but that’s all there is. 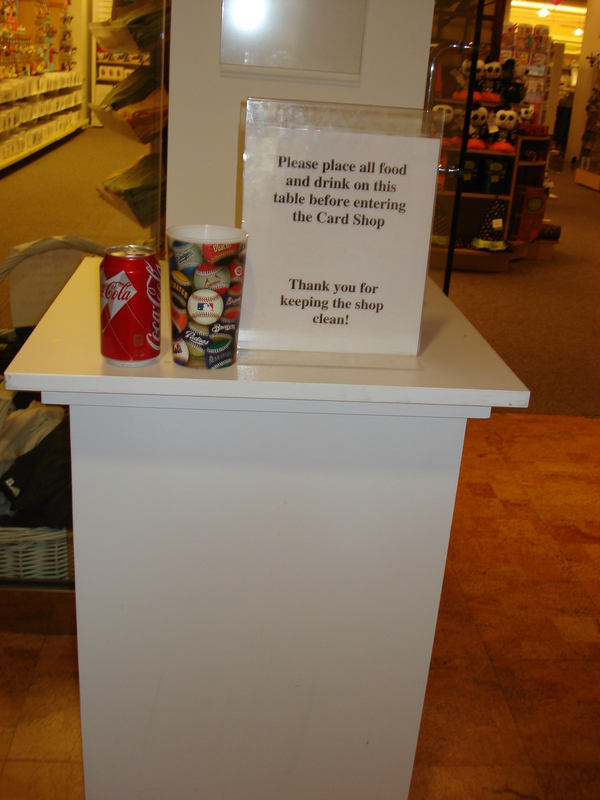 This store has placed a table underneath the sign making it easier for the customer to do the right thing and leave their food and drink outside of the store. The solution is simple and easy to understand. Can someone not follow the instructions? Yes. But there are fewer excuses for people not to do what is preferred. So the next time someone doesn’t follow what you want them to do, ask yourself how can I make the right thing easy to want to do and the wrong behavior impossible to do. Visual management is one of my favorite concepts. I never cease to be amazed at discussions, ah-ha moments, and alignment that happens from making things more visual. A group I worked with is responsible for entering data into the master system. This data has to be right for the planning, allocating, and production of the product to happen smoothly. The area was responsible for about one-third of the total errors that were occurring. In true Pareto fashion, there was one error that accounted for 85% of their errors. As you can see there can be a lot of data and a lot of distractions for the eyes. 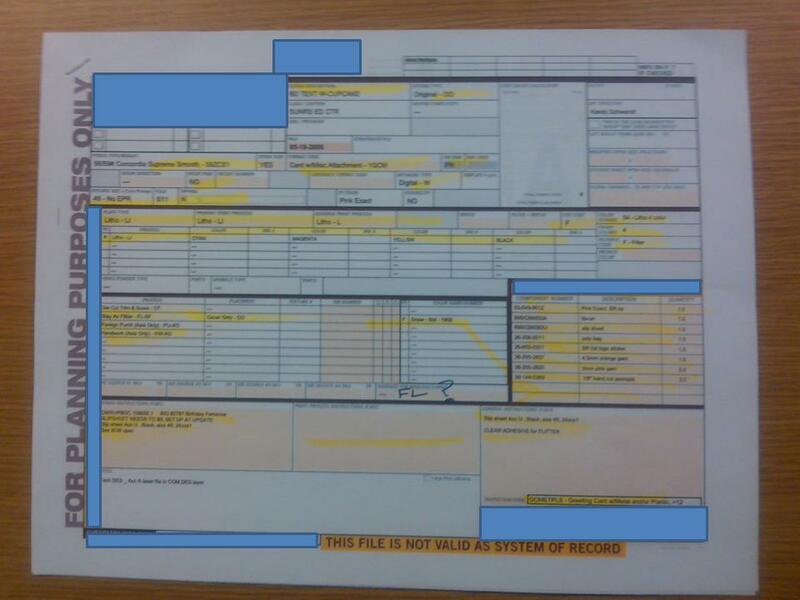 It can be very easy to enter the wrong data by pulling it off the wrong part of the sheet. So how did they go about it? The employees came up with a template. 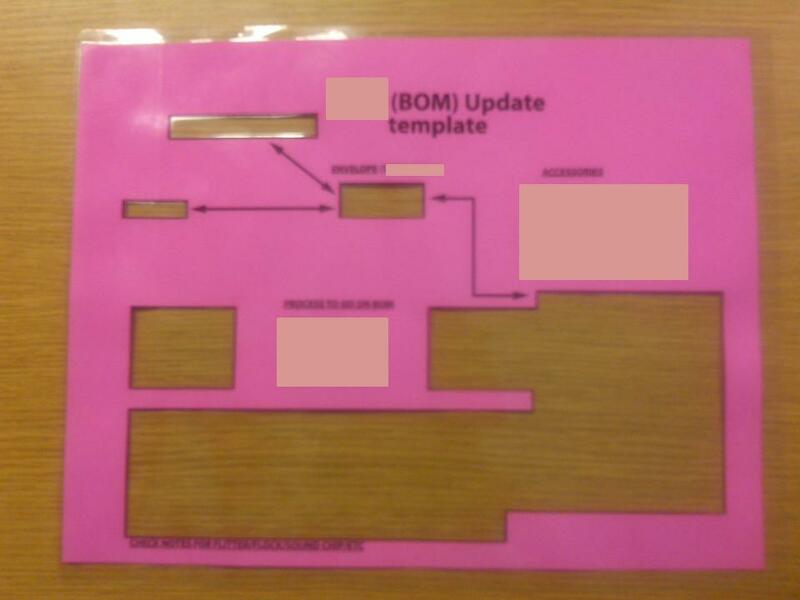 The template takes away all the eye distractions and allows the employee to focus in on the areas containing the data. 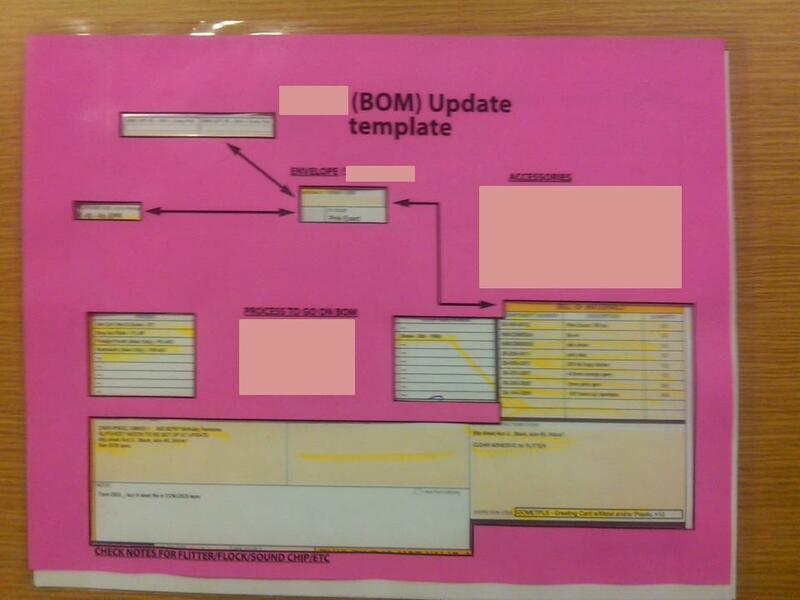 When the template is laid over the form, the data is much easier to find. The arrows and instructions help keep it visual. The errors have dropped significantly since the templates have been used. It is a great example of an employee generated idea showing creativity over capital. A few weeks ago, I bought a shelving unit from Target. The kind that comes needing a bunch of assembly and most people dread putting together because the instructions aren’t written very well. I have done plenty of them and look at it as LEGO for big boys! One reason people hate the assembly kits so much is the big bag of screws, washers, Dow rods, etc… that is always a nightmare to sift through to find parts for each step. Well, not this time. Apparently, the manufacturer must have had some customer feedback about how much of a hassle it is because this time all the hardware was pre-sorted for each step. 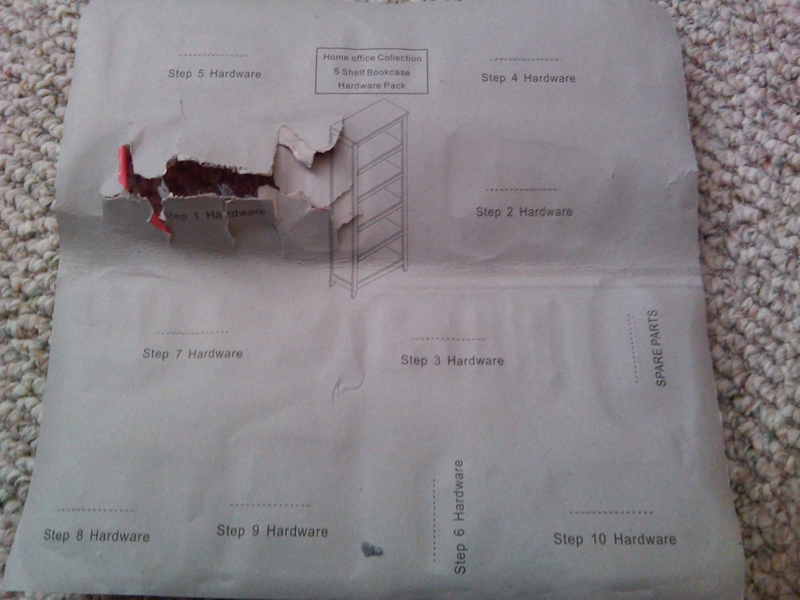 The front shows the hardware separated for each step and the back of the packaging tells what step the hardware is for. All I had to do each for each step was open the appropriate compartment and use the hardware. It was sorted and counted out properly. This provided visual queues as whether or not if I forgot something. If all the pieces were used, I should be alright and if there was a component still on the floor then I missed something. I compare this to how some companies use material handlers to do the non-value added work to present parts to the value added operator so less time is taken by the value added operator to assemble the finished product. 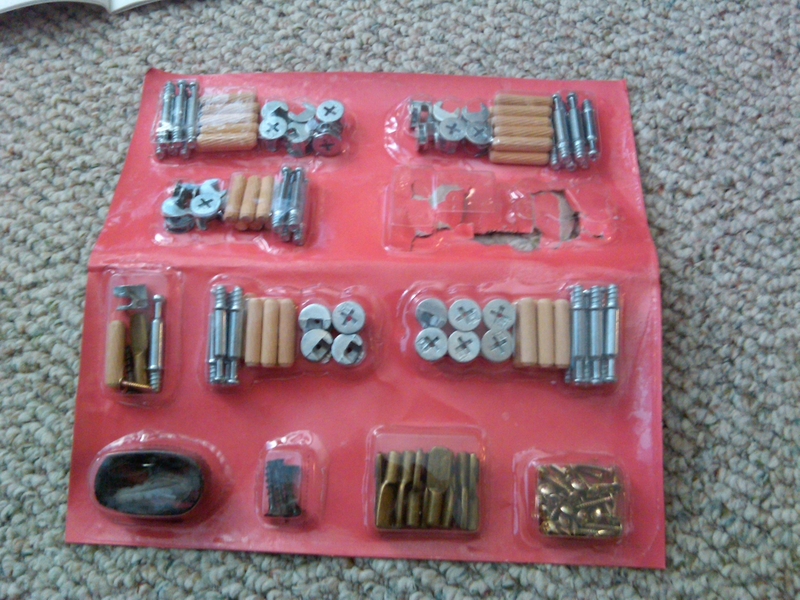 The manufacturer took the non-value added task of sorting the hardware needed for each step and packaged it together. This meant me, the value added operator, didn’t have to spend the time looking for the right hardware during each step. I took less time to assemble this shelving unit than I have for any other unit in the last 10 years. It was great. One last thought on the manufacturer. I would imagine they fought conventional thinking to do this, because it would be easier to package all Hardware A together and all Hardware B together in their silos and then throw that in the box. Instead they probably had to get all the components into a common area before separating them. Plus, the packaging I would assume cost more than a plastic bag that is heat sealed. Over all, I liked this convenience. It definitely added value for me. I have always been active and continue to try and stay active. I go to the gym and workout a few days a week to try and stay in shape. A couple of weeks ago, I switched gyms that I was working out at. The new gym I go to has many more machines that target muscles more specifically. The thing that got my attention most was how well they targeted the muscle it was designed for. I wasn’t doing any new exercises or trying to target different muscles, but I was more sore than I had been in the past. 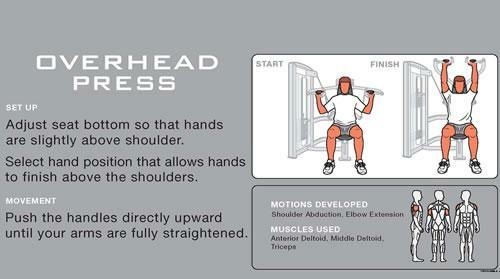 I have been using a weight machine for several years to do the overhead press to work my shoulders. At the new gym, I find the overhead press machine. It looks a little different. As I use it, I notice that my range of motion feels better…..more natural. I’m not fighting how my arms move. They are just moving comfortably. I did the weight that I have been doing for a few weeks. The next day, my muscles felt more exhausted and worked then I have ever felt. By making slight improvements to the design of the machine to mimic more natural of a movement the machine target the muscles more directly and made my workout more efficient. One other improvement was the use of visual standard work. One the machine is a plaque that details what muscles it is designed for. 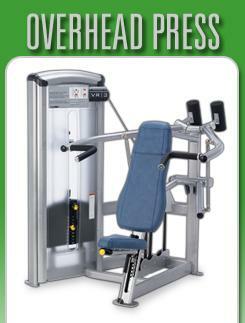 It also gives instructions on how to set up the machine seating for use to best target the intended muscles. Below is an example (click to enlarge). The instructions on the machines at the new gym are more detailed then this one, but I wanted to give an idea of what was on the machine. Examples of lean concepts are everywhere. Do you see other examples at the gym? Where else do you see examples being applied?